Religions: Singular worship of Sendar. Major Imports: Timber, jewels, metal goods, slaves, tobacco and furs. Major Exports: Salt, ivory, oil, silk, glass, spices, copper, horses. Currency: Affmargen, Sand Mark, large minted copper coin with the seal of the Sand King is worth the equivalent of five silver. Life and Society: The theocracy of Pax Thallos, as it is known today, can be traced back about one thousand years to Sand King Ulmter I, the first prophet of Sendar (see history of the Thallan Holy Lands). The continent of Pax Thallos encompasses the lands of High Dar, the Shaderock Pirate Confederacy, the Holy Thallan Parishes of Ec Lo, Kedabus, Flausan and the central capital parish of Pax Thallos from which the region is named. The regions of Shaderock and High Dar are included in the Thallan continent, but are not controlled by the Church of Sendar. Slavery plays a vital role in Thallan culture. Two major contributors to the Thallan slave trade include the ready supply of desert tribes, known as free tribes, and Church Law, which dictates indentured servitude as punishment for a wide range of crimes. In addition, the pirate confederacy of Shade Rock is well aware of Thallan demand for fresh slaves and fills the slave pens of Estercarn and Bactriex as often as possible. The destruction of Kal in 2258 CM bolstered the slave population of Pax Thallos as thousands of Reg’ostran refugees fled east to the desert nation. As the Reg’ostrans arrived they were quickly rounded up and sold into slavery. The few that escaped into the desert have since founded or joined existing free tribes and adamantly oppose or elude the Thallan government. Life within the capital province of Pax Thallos and the major metropolis of Sil is dominated by church authority. Many that call this region home do so with great fear or respect for their government. The lands of Pax Thallos proper, envelop the southern half of the Scorched Lands to the north, and the entirety of the Kalsar Dunes and Ad’risean Waste to the south. They stretch from the Copper Sea in the west to the edge of the Scourlands in the east. A terribly hot and inhospitable land, most residents crowd the metropolis of Sil or live scatted throughout the desert in small tribes surrounding what few watering holes can be found. Major Geographic Features: Thallan geography is comprised mostly of desert, wastelands, badlands, scablands, mountains and hills. 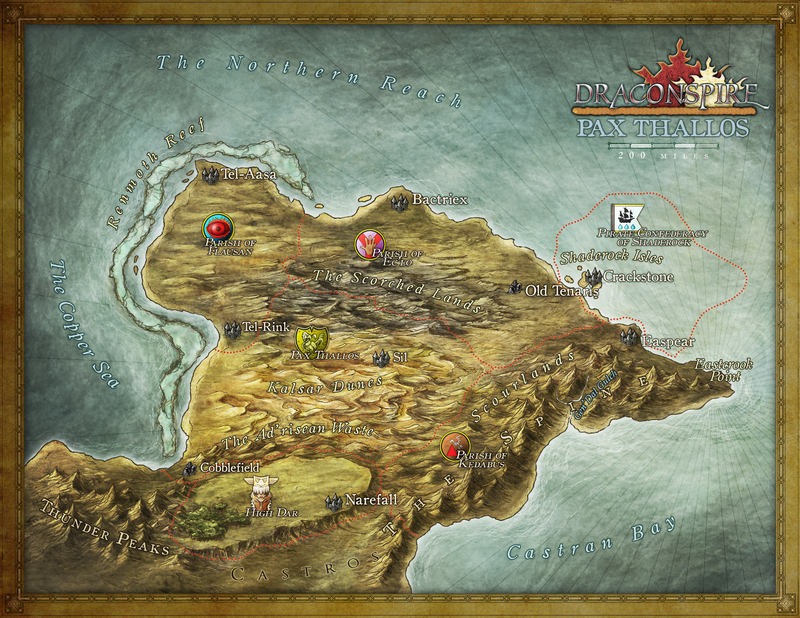 Below is a list of the major geographical regions within Pax Thallos. Qual Ineth, Scorched Lands: Temperatures near the center of the Scorched Lands can range from 134 degrees during the day, to around 98 degrees at midnight, the northern edge of the Scorched Lands sways around a more tolerable 90 degrees throughout the year. These blasted lands are comprised of twisted black stone, odd red granite deposits and petrified trees, suggesting that the desolated landscape was once a thriving forest. The Scorched Lands as a whole receive less than 5" of rain a year. The oldest maps of the world show the lands of northern Pax Thallos as a sprawling forested mountain range. Tales from the oldest elders, of the most tenured free tribes, speak of a great mage named Servio. It is said that Servio lived within a tower that once stood in the heart of this ancient forest. Servio became obsessed with some dark study. Rumored to have found the secret to immortality, some say he attempted to ascend to godhood. For whatever the reason, he locked himself away. It is said, depending on who tells the tale, that his failure or success birthed the Scorched Lands. Many adventurers have ventured into this region seeking the lost tower of Servio never to return. A few have come back, but they always say the same to any would be treasure hunter. "That desert holds no secret, but death". Bora Vol, Thunder Peaks: The Thunder Peaks are named for the constant storms that riddle their spires. This area has seemingly un-exhaustible veins of copper that the Thallans guard tightly. From the peaks come constant reports of kobolds, giants, rogue phoenix, sphinx, and even rumors that a brood of red dragons dwell within the highest caves. Many have heard the accounts and tales spun by the Qnarr dwarves that live within these mountains about the birth of the Scorched Lands and a great red wyrm of legend named Leviliss. It is said that Leviliss laid waste to the once verdant lands of northern Pax Thallos in an attempt to kill Servio for a secret pact the mage had broken. It is also whispered that Leviliss’ spawn still dwell within the mountains many caves, twisting their own plans of revenge. High Dar: Just south of the Ad’risean Waste is a massive elevated tableland known as High Dar where sweeping grasslands extend for over two hundred miles. See The Lands of High Dar for additional information regarding this region. Renmoth Reef: The Renmoth Reef lies off the western shore of Flausan and Pax Thallos, comprised from thousands of interlocking coral reefs the Renmoth system creeps along nearly one third of the Thallan coast line and is the single largest organic structure on the planet. One of the most bio diverse regions of the world, Renmoth is home to over fifty thousand species of fish and invertebrates. The reef garners its name from the infamous Renmoths that inhabit the region, manta rays of extreme size, power and cunning. The water surrounding the reef stays at a constant 80 degrees year round, never fluctuating more than 5 degrees in a given month. The Renmoth provides the western shores of Pax Thallos with calm and peaceful shipping lanes, protecting the western coast from the most violent of storms in the nearby Copper Sea and Northern Reach. Kalsar Dunes: Widely regarded as one of the most inhospitable regions of Tharstelding, the Kalsar Dunes are a barren land fine sand dunes and scorching wind. With average yearly temperatures of over 100 degrees and rainfall of less than one inch per year it is hard to imagine why anyone would call these lands home. Nonetheless the Kalsar Dunes are home to one of the largest and most successful cities of modern time in Sil. Outside of Sil the barren dunes are wrought with danger. Desert drakes, large scorpions, hives of formians and ant lions are all known to inhabit this region. Nomadic tribes of desert giants, ash giants and trox take refuge in the deep reaches of the Kalsar Dunes. Shaderock Isles: This large chain of islands off the northern coast of Pax Thallos is home to a loose pirate confederacy. See Shaderock Isles for additional information regarding this region. The Ad’risean Waste: The rolling wastes to the south of the Kalsar Dunes are suprisingly rich in game and fertile soil, only a lack of sustainable water restricts the Ad’risean Wastes from full scale cultivation. A land of extreme heat and bitter chills, sudden thunder storms and flash floods, these are the lands of the Afat’Inart, ancient and fabled horsemen. The Afat, as they are called, are renowned hunters that live off the region’s roving herds of mammoth. The mammoths provide meat for eating, hide for tents and clothing, bones for tools and weapons, and valuable ivory that the Afat gladly trade in Sil for resources not commonly found in the Ad’risean Wastes. A rare insect, the jade worm, produces a high quality silk. These elusive insects live in scattered succulent and cactus groves, attracting textile merchants from across the nation with the promise of great wealth for those lucky enough to discover a hive. The wastes stretch some four hundred miles from the ruins of Cobblefield along the shelf of High Dar to the base of the Spine in the east. Scourlands: The Scourlands are a barren, generally soil free landscape located in east Pax Thallos at the foot of the Spine Mountains. Riddled with small hills and dry creek beds, the Scourlands were formed thousands of years prior as large glacial deposits melted from the lower lying Spine Mountains. Wild swings in temperature sweep through these lands on a daily basis, with blazing hot days and frigid nights abundantly common. Throughout the months of Bladewater and the Falling, the Scourlands are bombarded with fist size hail and flash floods, further sweeping their hillsides clean of all but the most stubborn of brush and stunted trees. The region houses hundreds of natural caverns and crevices, which in turn provide ample hideouts for bands of brigands, tribes of orcs and dens of gnolls. Furthermore, the landscape is dotted with the husks of colossal petrified hives. The remains from an age when the Scourlands were fertile and home to a network of sentient bee creatures, called the Zesk. Gen’Dal Gulch: The Gen’Dal river cascades south through the north central Spine Mountains, carving the Gen’Dal Gulch from the surrounding mountainside. Sudden rainfall and snow melt feed the hungry river, which violently runs for over a hundred miles before depositing itself into the Castran Bay. The resulting gulch walls are peppered with slabs of deep purple and green granite, making this impressive natural feature one of the most visually stunning sights in the world. Over thirty large waterfalls follow the path of the Gen’Dal River from its starting point near the summit of the Spine Mountains. Lightly inhabited by prospectors, mining and milling villages, as well as farmers, the rural mountain towns live mostly in isolation from the rest of Pax Thallos. Eastcrook Point: Eastcrook Point is the eastern most landmass of Tharstelding. Its southern edge rests along the Castran Bay, whereas its northern edge shelters the Castran Bay from the violent swells of the Northern Reach. Differences in ocean temperature, strong onshore winds and opposing currents between these two sea masses result in dangerous undertows, unpredictable whirlpools, and inconsistent tides that surround hidden rocky outcrops. Most seafarers give the peninsula a wide berth, opting to sail out of sight instead of risking a watery grave. Pirates from nearby Shaderock speak of the hundreds of merchant vessels that have been claimed by the surrounding waters, their holds resting on the rocky ocean floor just waiting for a captain brave enough to test their mettle. Important Sites: Pax Thallos is one of the most sparsely populated regions in Tharstelding, per square mile. Nonetheless, the area houses several impressive cities and ruins. Below is a list of the most prominent sites in Pax Thallos. Sil: (Metropolis 98,568) City of the Sand God and seat of Sand King Ramses II. Sil is the capital of Pax Thallos and the Thallan Holy Lands. Dozens of temples and hundreds of bizarre shops line the main streets which crisscross in a jagged sun like pattern. Brass and copper shingles or plates are commonly used to roof the cities larger buildings and palaces, making the tallest structures viewable from a great distance in the surrounding desert and acting as lighthouses to signal distant travelers. The Sand God is worshiped exclusively in Sil. The churches headquarters, the Temple of Dunes, is located near the center of the city on the shore of a deep and seemingly inexhaustible oasis. The Temple of Dunes also functions as the nation’s ruling government. Preaching any religion but that of the Sendar is punishable by public beating, exile, forced slavery or death. Outsiders are, for the most part, welcome to come and trade. Overextended stays usually draw the attention of church inquisitors. For the most part Thallans distrust outsiders, but tolerate them. Directly outside of Sil’s walls, the nationalized oil operations employ most of Sil's residents and slaves. It is said that if you have a pint of oil in your pack, the odds are good that the bottle’s glass, and the oil, were both drawn from the mighty desert that surrounds Sil. Tel-Rink: (Metropolis 27,495) Known by seafarers and travelers as the jewel of the desert, Tel-Rink is a thriving, bustling port city. Most of Pax Thallos’ imports and exports travel through Tel-Rink via a series of manipulated reefs turned into living docks. Shallow salt mines and spice fields surround the city, creating small villages that employ most of the city’s residents that do not work on the docklands. Saffron, myrrh, cinnamon, sumac and vanilla are all produced and harvested in this region, making Tel-Rink one of the wealthiest cities in all of Tharstelding. The cities Mirrored District produces a variety of clear and stained glass, which is packed for distribution and displayed in Tel-Rink’s architecture. An old and feared assassin's guild, known as the Black Iron Company, operates in the shadows of the city, accepting contracts anywhere in the world for those able to pay their steep fees. The people of Tel-Rink are more tolerant of strangers, being a port town, many of its services such as brothels, opium dens, gambling halls and taverns rely on traveler’s continued patronage. The ruler of Tel-Rink is a merchant minded priest of Sendar named Xercies Asafa,r who is adept at running one of the most complicated economic cities in the world. Narefall: (Large City 19,296) The de facto capital of High Dar, Narefall, more suitably resembles a wandering carnival of hulking wagons than a proper city. The caravan moves between several grazing and farming sites, taking shelter within a valley along the southeast shelf during the wet season. Narefall is ruled by the Table of Sez, a matriarch Olyn Folk body, comprised of twelve of the eldest and wisest of their people. When a member passes, a new crop of female elders is brought before the council for consideration, after which the candidate that displays the most knowledge about Olyn Folk culture, tradition and history is appointed to the Table of Sez for life. While consisting primarily of Olyn Folk, the native Keks are not an uncommon sight within Narefall, often arriving to trade or to take shelter when outcast from their tracts. Sessul are also seen within Narefall, with most other races and cultures nonexistent or exceedingly rare. Tel-Aasa: (Metropolis 29,771) Red quartz walls surround the port city of Tel-Aasa, making the metropolis appear to be a blazing red eye when viewed from a distance. The capital of Flausan, Tel-Aasa was captured in the first Epoch Crusade by the fervent armies of Utoli Terriam in 258 CM. The Mers of Thes operate from the largest building within Tel-Aasa, the Grand Alcazar, a gilded palace that used to serve as the seat of power for the Sultans that ruled Flausan over a thousand years ago. Here the consortium of merchants and tradesmen that make up the Mers of Thes conduct money lending and provide banking services for merchants throughout Pax Thallos. The ruler of Flausan, Overseer Akila Neferos, holds mass in the Temple of Roses each day, the region’s largest temple of Sendar and the second largest church in Pax Thallos. Overseer Akila is well loved by her people, and rumors have begun to circulate that if the powerful cleric were to declare the parish’s independence, thousands would spring up from the surrounding desert to support her claim. Bactriex: (Metropolis 37,221) The capital of Ec’Lo, Bactriex rises from the shores of the Northern Reach like a series of massive bee hives along a crux of blood red stone roads. An old and ancient city, most of the conical towers that give Bactriex its unique skyline have stood for over a thousand years. The cities distinct blood red roads are quarried from red granite deposits found in the northern edge of the Scorched Lands to the south. The population of Bactriex is bolstered by the regions emphasis and acceptance of slave labor, nearly one fifth of all residents are indentured or owned servants. Irrigation channels swath the southern roads, bringing water from distant springs to otherwise dry but fertile fields. Groves of dates, lemons, limes and blue melons stretch from the city deep into the south. Crackstone: (Metropolis 25,079) Crackstone rests on the bones of an ancient serpentfolk city, its labyrinth network acting as a foundation for the sprawling metropolis above. The Undercity, as it is called, draws the seediest of pirates and cutthroats to its depths as well as the bravest of adventurers and explorers bent on discovering the deep vaults rumored to have been abandoned by the serpentfolk as they fled the region. The harbor of Crackstone is magically calmed by a series of runed pillars that keep the bay calm as glass, making the city a safe haven for travelers passing through the otherwise stormy and torrent waters of Shaderock. The Tempest Eye Triumvirate rules the Shaderock Isles from Fort Ripcove, a cannon ringed fortress that overlooks the harbor and surrounding shores. Nearly anything one could imagine or desire can be found within the pirate capital of Crackstone, if the customer has enough coin or ambition. Easpear: (Large City 22,095) Easpear is an isolated industrial city, choked with soot and smoke from its many foundries and smithies. The mountainous settlement also houses two massive gladiatorial arenas carved into the dormant bowls of two long dead calderas. The fortress of Remonz looks down over Easpear, shaped like a massive flanged mace poised to drop on the small folk below. 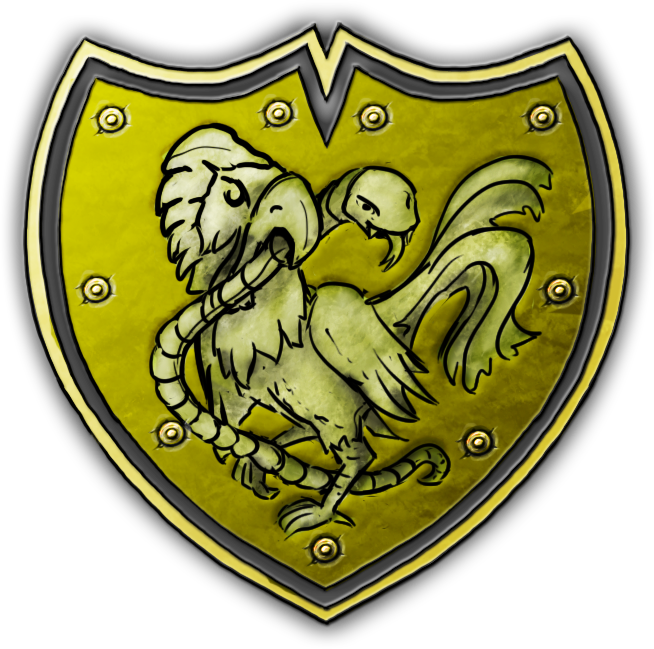 The capital of Kedabus is also home of the Extriarchs, an elite band of inquisitors tasked with the duty of upholding church law and rooting out heresy. Cobblefield: Ruins: An abandoned dwarven city carved into the side of Mount Killspike, the northern most mountain in the Heman Dal range. Cobblefield was a thriving city long ago, but when the adamantine mine dried up, the dwarves moved on. The city lay vacant for a short while, than Sand King Bel’Arnarn garrisoned it with soldiers to maintain strong borders with Castros during the Blackfoot war. Shortly after the war the city was sacked by chief Pebblenose, a mighty goblin warlord. The ruins are rumored to still be under goblin control today.